Nov. 12, 2018—radio interview with Rhett Palmer (iHeart Network nationally and in Vero Beach, Fla., on WAXE AM & FM). Discussion of all my books. May 28, 2018—radio interview (WCBQ-AM and WHNC-AM, North Carolina). Discussion about Dylan on Dylan with Dr. Alvin Augustus Jones. Oct. 2, 2017—talk and Q&A (Nutley Public Library, Nutley, N.J.). Discussion of my books. June 8, 2017—talk and Q&A (Livingston Public Library, Livingston, N.J.). Discussion of my books. Dec. 18, 2016—live radio interview (WABC, New York; KABC, Los Angeles). Discussion of Lennon on Lennon, The Late Joey Reynolds Show. Dec. 15, 2016—TV interview (various PBS stations, Northeast U.S.). Discussion of Lennon on Lennon, One on One with Steve Adubato. Taped 10/26/16. Dec. 6, 2016—radio interview (WHJY-FM, Providence, R.I.). Discussion of Lennon on Lennon with Paul Fuller. Aired 12/8/16. Nov. 15, 2016—radio interview (WEOL-FM, Elyria, Ohio). Discussion of Lennon on Lennon on Morning Show with Craig Adams. Nov. 15, 2016—radio interview (WDAD-AM, Indiana, Pa.). Discussion of Lennon on Lennon on Indiana in the Morning with Todd Marino. Nov. 11, 2016—live radio interview (LBC, London). Memories of Leonard Cohen with Aian Dell. Nov. 11, 2016—live TV interview (France24, Paris). Memories of Leonard Cohen. Nov. 8, 2016—radio interview (Premier Networks, syndicated nationally): Discussion of Lennon on Lennon with Mike McCann. Nov. 2, 2016—radio interview (WXKR-FM, Toledo, Ohio). Discussion of Lennon on Lennon on Morning Show with Mark Benson. Aired 11/7. Nov. 2, 2016—radio interview (WOBM-FM, Toms River, N.J.). Discussion of Lennon on Lennon on The Ocean County Breakfast Show with Shawn Michaels. Aired 11/7. Listen now. June 6, 2014—podcast interview. Discussion of Leonard Cohen on Leonard Cohen with Kinston [N.C.] Free Press‘s Jon Dawson. Listen now. May 27, 2013—live radio interview (WOJB-FM, Hayward, Wisc.). Discussion of Springsteen on Springsteen with Eric Schubring. May 20, 2013—radio interview (CKCU-FM, Ottawa, Canada). Discussion of Springsteen on Springsteen. Listen now. May 1, 2013—live radio interview (WBSM-AM, Fairhaven, Mass.). Discussion of Springsteen on Springsteen. April 23, 2013—live radio interview (KSRO-AM, Santa Rosa, Calif.). Discussion of Springsteen on Springsteen with Steve Jaxon. 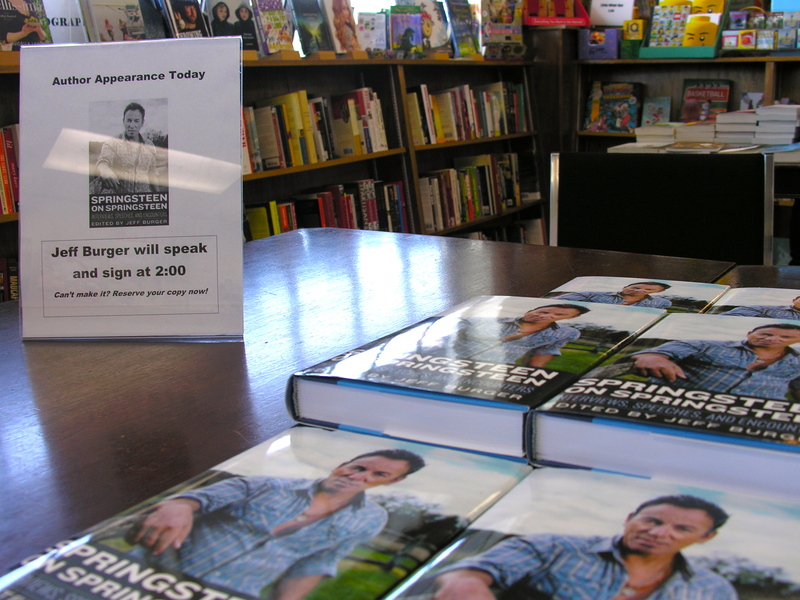 April 6, 2013—book signing and reading. Springsteen on Springsteen. 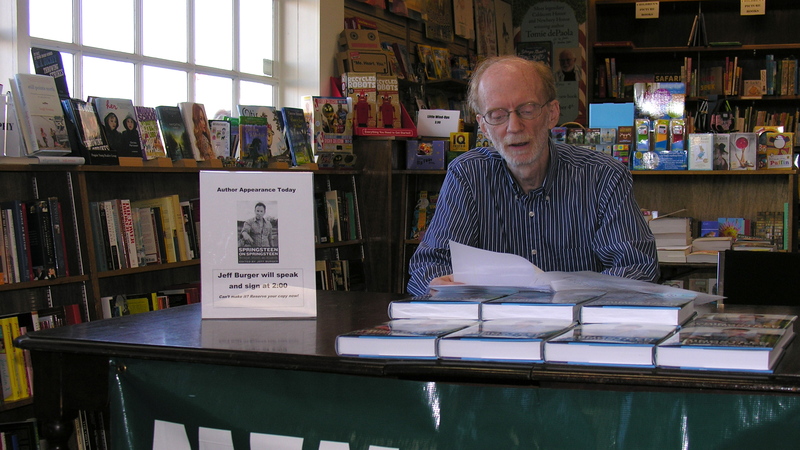 Mendham Books, Mendham, N.J.
March 29, 2013—radio interview (KTRS, St. Louis). Discussion of Springsteen on Springsteen with DJ John Carney. Listen now. March 26, 2013—radio interviews (WMGK, Philadelphia; KPRI, San Diego; WKLX, Bowling Green, Ohio; KLPX, Tucson, Ariz.; WBAL, Baltimore; KZNE, College Station, Texas; KNEN, Norfolk, Va.). Discussion of Springsteen on Springsteen.